In this episode, We’re talking about FEES! I never really planned to do an episode about this because I thought this was something most agents were already doing. But as I’ve spent time in more groups, and heard from more agents, I’ve learned that that’s not the case. So I’m sharing the reasons I REALLY think you should be charging for your time and expertise. And I offer a few tips to help you ease into it. Links to any resources are below, as well as a list of the website features discussed in the episode are below. Christy here. Welcome to another episode. This episode we’re going to be talking about fees and why you should be charging fees for your services. And I know this is nothing new to some of you, but I’m learning, as I spend more time among different groups of agents, that it’s not necessarily something that everybody is aware of or has heard before. So, I just want to do my part to get the message out. For you experienced agents, go ahead and listen anyway. If you’re already charging fees, maybe you’ll pick up something that makes you feel more confident or encourages you to increase your fees. Because I’m not talking about a $25 airline booking fee and I’m also not talking about a plan to go fee where the fee is like a nonrefundable deposit and you apply it to their final booking. What I’m talking about here is several hundred dollars to book the whole trip, that you keep. All of this is what you’re charging for your services, for planning the vacation, for monitoring, payment deadlines, and for being available when your clients are on vacation to help if something comes up. So even if you are already charging fees and you don’t think you need this information, I’d encourage you to listen because maybe you’ll hear something that changes your mindset a little bit and makes it easier for you. If you’re not charging fees, please do listen. I think this is a really, really important thing for your business. If you want to have a profitable business and a business that you love, then I think you really should consider charging fees and just try it for a few months and see how it works. So let’s jump right in and I’m going to start by giving you the reasons I think you should start charging fees. And the first is that commissions are not guaranteed. The airlines proved this few decades ago. It was before my time as an agent. But they stopped paying commission to travel agents so all these agencies were left with losing a big chunk of their income and a lot of agencies went out of business. And then others had to find other ways to earn money, which is why there is such a focus on selling cruises and things because they had to make up for that airline commission. There was a big push, back then, to have agencies charge even just $25 or $30 per airline ticket that they were booking to help make up for some of that lost income. But I don’t want you to be caught unaware and scrambling to try and save your business. I’d rather have you be prepared for the fact that someday all your commission could go away, including Hotels and cruise lines. Hotels are already really encouraging people to book direct. They’re offering incentives in lower room rates or incentives like free internet and things if they book direct. They also have already recently cut a commission that they pay to event planners or people who book groups of rooms. So their group room commission is lowered. It’s just a matter of time before they decided to try it with individual room bookings and cut the commissions there as well. So it’s just not anything that you can rely on. It’s better to assume it’s going to go away and look at it as a bonus than to rely on it for your whole business and have it go away one day and then potentially lose your whole business because of it. Also, if you’re relying on commission, not only are you not in charge of your own destiny, but you really aren’t able to serve your clients first because you’re always having to worry about who’s paying what commission. If you’re torn between a condo stay or a vacation home rental that doesn’t pay commission or a hotel stay, that does, but you know the whole home rental is really better suited for the kind of vacation your client wants. You have to make that choice, like: am I going to make any money on this, and do all this work for nothing? Or am I going to choose something that maybe isn’t exactly what my clients want or need right now, but it allows me to stay in business? If you’re charging a fee for your services, this isn’t even a question. You’re already making money. You’re being paid to plan their vacation, you’re being paid to find the right accommodations and the right tours and the right tour guides and plan it all out. That’s what you’re being paid for. You’re not paid to make a hotel reservation, so because you’re getting paid already, you’re able to book some things that maybe aren’t commissionable or maybe don’t pay as much commission as another option, because you’re already earning an income, and earning what you need for that booking. It also allows you to take on fewer clients because you’re making more per booking so you can spend more time really planning a great vacation for those clients and doing an amazing job, which in turn will help earn you more referral business. You’ll have to spend less time and money on marketing, so it just really helps you focus on your clients more. Which will help you build your business more and build your business easier and it lets you spend more time on the things that you wanted to do when you decided to start your own agency in the first place. And then finally, this is what I hope will really get you guys if you’re on the fence right now, if you hate those tire kickers and those price shoppers, charging a fee will virtually eliminate them. It gets them right out. If you are sick and tired of losing clients, putting together a proposal and getting their whole trip planned out and then they decide to book at Costco because they got a $50 Costco credit with their booking, those days are over. If you charge fees, will you lose a couple of bookings because you charged fees? Probably, but these are not the kinds of people you want to build your business on. These would be people who, like I said, will book with Costco if they get offered a free Costco gift card with booking, or they’ll go to the rebater as soon as they find out that there’s a rebate, or who will give them a bit of a discount on their cruise or a kickback if they book with them. These are not people worth losing sleep over and if you’re charging fees, first of all, you don’t have to deal with those people anymore, but you’re also growing a business, and a client base, of people who value what you do, value the time that you save them, value the expertise that you bring to their trip, value the care that you put into putting together every single detail, finding the right hotel, finding the right restaurants, finding the right tours. These are the kinds of clients you want. You don’t want to build your business on people who are going to balk at paying a few hundred dollars to have somebody save them hours and hours and hours of time and provide them an amazing vacation. So hopefully that’s enough to convince you to start charging fees. Those are my best reasons, and if I haven’t convinced you, go ahead and shoot me an email, Christy@travelgeniuses.com and I will do my best again to try and convince you because I really, really think that this is probably the number one thing you can do to change your business. It’ll help you enjoy it more because you won’t have to be working with as many clients, you won’t be dealing with as many price shoppers and tire kickers. And, it’ll bring in those valuable clients, the clients that are fun to work with, who appreciate what you do, and that is the number one way to start enjoying your business. So now that I’ve hopefully convinced you that you should be charging fees, let me help you ease into it because I know it’s scary. Even if you really believe that you should, it’s still a super scary thing for new agents and experienced agents alike. I keep going back and forth on which one I think it’s harder on. But it’s hard on both of you. So I’ll cover ways to make it easier whether you’re new or whether you’re an experienced agent. First I want you to just realize that you are worth it. You provide a valuable service that people are willing to pay for. And there’s this perception out there that because of the Internet, everybody can just book their own travel and look everything up online if they want, and book it all online, and they don’t need us anymore. But that is not true. In fact, a few years ago, everybody was like, “Oh, you have to work with baby boomers because they don’t like the Internet as much.” And guess what? Millennials are now the age group that uses travel agents more than any other. And I’ll link to an article in the show notes here, (https://www.travelandleisure.com/travel-tips/travel-agents/millennials-travel-agents) but I believe it’s something like 18 percent of baby boomers use a travel agent and 33 percent of millennials do. And listen, these are people who have grown up with the Internet, who know how to use the Internet, who don’t even know life without the internet or a computer, and barely even know life without a smartphone. So don’t believe for one minute that just because the Internet happened, that there is no more need for you. And “why would anybody pay for a travel agent when they could just do it themselves online?” Because people don’t want to do it themselves online. Look, I could go online and I could figure out how to change the oil in my car, but guess what? I don’t want to. I have no desire to change my oil. I don’t want to deal with the mess. I don’t want to take the time to do it. I have better things to do with my time, and I don’t want to take a chance that I’ll mess something up and break my car. Vacations are the most valuable thing people have now. Their free time is the most valuable thing and your time is the only thing you can’t get back. So if they’re going to spend all this money, and use their valuable vacation time, why wouldn’t they have somebody who knows what they’re doing, plan it all out, make sure all the logistics are working, make sure that they’re getting the right hotel and the right destination and the right activities for them? There is an art to planning a great vacation and not everybody wants to do it or is equipped to do it and you definitely save them a lot of time, a lot of hassle. You have more resources than them too, just because they can look it up online, you have connections., even if you’re a new agent, with your host agency and your preferred suppliers and hopefully you have a community of agents around you that you can go to for help. If you don’t let me know. I’ll point you in some good places where you can have some agents around to support you, but you definitely are doing something valuable. Don’t discount that. Don’t think that just because you know how to do it. Everybody else can. Look, I know how to build a website and it’s pretty easy to me, but that doesn’t mean that all of you find it just as easy. So just because it seems easy and like no big deal to you doesn’t mean that there aren’t people out there who look at what you do as making magic happen because it is like making magic happen. Now I want to talk for a minute to the new agents out there listening. I know some of you feel like you can’t charge a fee because you’re new and you don’t really know what you’re doing. That’s not true either. Even if you really don’t know what you’re doing, even if you didn’t have any resources available to reach out to for help. Like I said, your suppliers, your host agency, agents around you, preferred suppliers, things like that, you still are saving people time by doing this, so that’s worth something. But because you are in this profession, you do have access to all those resources, so make sure you’re using good suppliers. Especially when you’re starting out. You want to make sure you’re using suppliers that your host agency trusts and has a relationship with so that if something goes wrong, you have something to fall back on, and you have a way to reach the right people. So if you’re booking Africa for the first time, you definitely want to work with a good trusted supplier so that you’re not booking somebody into a dangerous situation or into a camp or maybe things aren’t quite as luxury as they planned on. So even if you’re a new agent, you’re still providing a valuable service and something that’s saving people time and creating a better vacation than they could plan on their own. So that’s the first thing. Just really understand and believe that you are worth it. I guess that was kind of a pre-step. This is the first step. First, give yourself a deadline. If you’re a new agent, you could just give yourself, say five bookings. “I’ll do five bookings where I’m not going to charge a fee. But then after that, I’m going to start charging fees.” And if you’re an experienced agent, maybe give yourself three months and that gives you some time to let your clients know and kind of work up to it and get yourself pumped up and say “okay, I’m going to do it” and get ready to charge the fees. Next, you want to set expectations. So if you’re an experienced agent and you have some clients already that are repeat customers, I would just go ahead and send them all out an email and let them know that on this date you’re going to start charging fees. Tell them why. Don’t say, “It’s because, you know. they’re lowering my commissions…” Don’t whine. They don’t care about your business, they just care about themselves. So tell them why it’s better for them. We covered this pretty much in the first section of this podcast. Just let them know that you want to make sure that you’re really able to spend the time needed on every vacation and you just can’t do that at the pace you’re having to book vacations now. So you want to make sure that you’re planning fewer vacations, but spending more time on them and in order to do that, you need to charge a fee. You can also explain to them that you want to be able to put them first. You want to stay in business so that you can still help them with their vacations, but you also want to be able to put them first and not have to worry about booking a product that pays more just so that you can keep the lights on. So just come up with a way, use your own voice, but give them some reasons that you’re going to be doing this. Let them know when it’s coming. And then for both experienced and new agents, what I want you to do is, from now on on your invoices, when you send out an invoice with the hotel and the cruise, or whatever the components are of their trip, add a line item there for your fee, a planning fee or whatever you want to call it. And then underneath the subtotal, subtract out the discount. So you’re discounting the whole thing. But just give them a discount so that they’re used to seeing it there, you’re used to putting it there, and then there’s the expectation there that that’s going to be the norm going forward. This helps, first of all, with their expectations. If they’re going to book with you in the future, they’re going to know that that fee’s there and they won’t be confused as to why it wasn’t charged before. It also helps if they’re giving you referrals, so when they refer a friend, the friend doesn’t come back to them and say, “You didn’t tell me that your agent charges xyz amount to book a trip.” So it just helps everybody all around. It helps ease you into it, makes it a little more comfortable, and let your clients get used to the idea that this is coming as well. Then the final way to ease into it is to not ease into it. Just do it. When that deadline comes, when you’ve booked your five free vacations or your three months is up, just go ahead and start charging fees. Even though you’re scared. You’re still going to be scared. Doing these things to ease in is not going to make it less scary, but sometimes you just have to do it even though it scared. One thing that might help is to imagine what your life will be like when you start charging fees. If you’re charging $500 per vacation and say you just book 4 a month, that’s $2,000 a month extra. What will you do with that money? How will that change your life? Will you just take on fewer clients and have more time to travel and spend time on hobbies or hanging out with your friends and family? Or will you pay off some debt? Will you get a new car? Maybe a second home. I don’t know. What are you gonna do with all that extra time and money? Imagine what your life is going to be like. That kind of helps motivate you and if you can see what’s coming, it kind of helps you get through the scary part there. If it helps. I’ve heard a lot of agents talk about this and talked to a lot of agents about this and I’ve only seen one or two agents who have said that they regretted charging a fee and it was because it was their first or second one and they lost a booking because of it. But guess what? Remember we talked about those clients that we don’t like. That’s who those clients were and that’s okay. So other than that, every agent I’ve talked to has been so excited and so happy that they charged fees and thrilled to find that when they presented the feet of the client, the client was shocked that it was so low or said, “Of course I would pay that much. You’re worth way more than that.” So I think you’ll be pleasantly surprised. But I know it’s scary to do something for the first time. I have a coach I’m working with and she made me do something that I was really scared to do and it was really dumb. It was just posting a link to my podcast on my personal facebook profile and I really didn’t want to do it because, I don’t know, I’d rather have strangers listened to me then have my friends and family hear me talking and trying to be professional because I’m not really very professional in real life. But anyway, I was like terrified to do it and she made me. We were on a call and she made me do it while I was on the phone with her and after I clicked publish she said, “Okay, well how did that feel?” And I said “Fine. It’s no big deal. It’s nothing. I don’t feel anything. It was just fine.” But the lead up to it was so… I mean I had been putting this off for months. So that’s it. Those are my reasons why you should charge fees and my tips on how to ease into it, make it a little easier to do, but I do have one more thing I just want to remind you of. And that’s it for this episode. There aren’t any worksheets or downloads for this episode, but I will link in the show notes to that article about millennials and how much they’re using agents now. 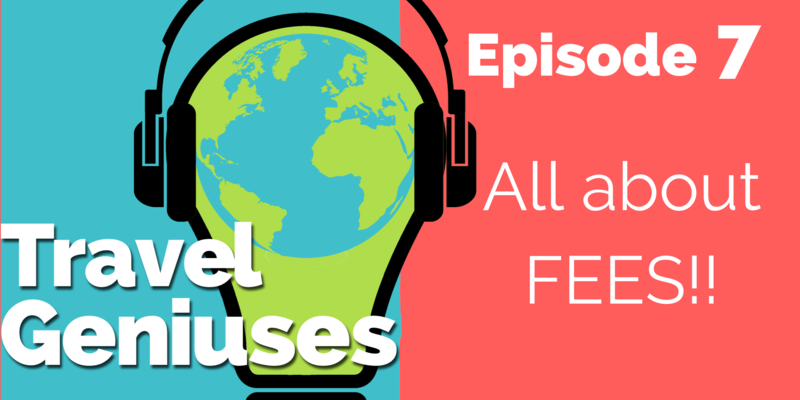 And of course, if you’re enjoying the podcast, please share it with other travel agents is the best thing you can do. I’ve been getting quite a bit of feedback and it’s really exciting. I love hearing from you guys, so I would love to reach more agents. If you’re finding this helpful, please share it. And that’s it., until next time.